My studio 'Glas & Keramik Art', which opened in 1999 in Frohnau, Berlin, functions as both a workshop and a gallery, where a larger number of selected works can be visited. I work with glass, ceramics, and mixed media. 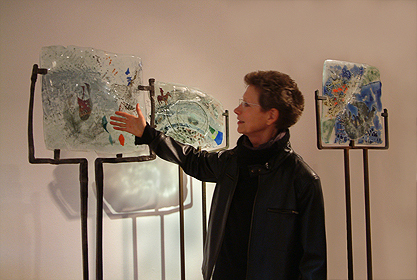 When working with glass, I use a variety of kiln-formed glass techniques to create both flat glass objects – which are then presented on metal stands or, like pictures, hung on the wall - and sculptures. From time to time, I create three-dimensional works structured by a woven mesh of wires which are then connected with molten colourless or coloured glass. These densely woven wire structures open up an unexpected wealth of creative possibilities; I keep coming back to this material. Glass opens up new encounters with transparency, mobility, reflections, colour, structure, light and shadows. It was this variety that led me to choose to work in this medium. In addition, I am especially fascinated by the play of glass with raku ceramics, but also with metal and other materials. Apart from the shape, the variety of surface structures are an essential characteristic of my ceramic sculptures, combined with modern and traditional firing techniques. Other materials include artifacts and curios I have collected over the years and which I occasionally incorporate into objects and installations. In my work, I like to play with materials, colours and structures. I frequently deliberately postpone making decisions during the creative process in order to preserve as many opportunities for change as possible. The wealth of experience I have gained from extensive travels all over the world is another source of inspiration – allowing me to create uniquely nuanced and witty objects.